September 27, 2016, 1:11 PM · Anyone who is a member of Violinist.com is welcome to write a blog on Violinist.com, and we'd like to encourage you to do so. But how do you do it, logistically? What are Violinist.com editors looking for in a blog? 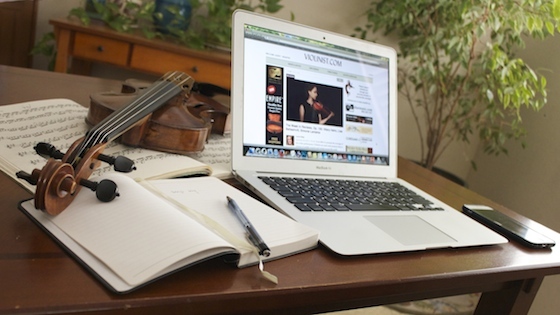 Here are some guidelines to help you set up a successful blog on Violinist.com. First, you must be a member of Violinist.com to write a blog on Violinist.com, so please register as a member. You will be sent a password; be sure to log in within 48 hours of registering, or your account will be deleted. (Why is this? To guard against fake registrations and robots.) Once logged in, find your profile page by clicking on "HI (your name)" in the upper lefthand corner. To upload a picture, click on the big square picture icon. When you upload your picture, be sure that it is a square picture, at least 270 x 270 pixels. If you are already a member of Violinist.com, log in and go to your profile page, to make sure that the information is current and that your picture has been updated. Click directly on the picture to upload a new one (don't forget, it needs to be square! ), and click on "EDIT" to change anything with the wording. Write your blog in a plain text editor such as Textedit or Notepad, something with minimal automatic formatting. Do not write your blog on the blog entry page, in case your connection times out or drops before you finish and you lose the whole thing! If you want your blog to be considered for the front-page and promoted blogs, it will need a photo or graphic that is 560 pixels wide by 315 pixels tall. To embed an image, please use the HTML code for images. For example: &#lt;img src="http://www.violinist.com/art/members/laurie.jpg"&#gt; Please do not embed images more than 560 pixels wide. You can upload and store your photos on any of a variety of photo-hosting services, such as Imgur. In a pinch, email Laurie for help with photos. To post a blog, first make sure you are logged in. Then find "POST BLOG" in the upper lefthand corner of any Violinist.com page and click that link. Copy your completed blog and paste it in the window labeled "Your entry." Write a headline, click on "Post entry," and your blog is posted. Your blog will appear at the bottom of the "NEWS AND ADVICE" page and will have its own link that you can use to share your blog. Within 24 hours, editor Laurie Niles considers each blog that is submitted for the front page; if it is approved, it will appear there and may be promoted on Violinist.com's Facebook, Twitter and other social media sites. Violinist.com blogs are in English. Blogs should follow basic standards of good writing. Spell names and words correctly, punctuate correctly, use the rules of grammar, etc. Please keep formatting to a minimum. Approved formatting includes: bold, italics, numbered lists or bullet points. Good writing gets ideas across without a lot of extra formatting, so please resist the temptation to use all capital letters, different-sized headlines, colored lettering, and other extraneous formatting. When you write in all capital letters, this is the Internet equivalent of screaming at another person. Please don't scream! If you interview someone, you must make it clear to that person that you are interviewing them for a story and that you have their permission. Only use pictures and names of children if you have their permission and their parents' signed permission. Verbal permission doesn't count. Can I post a blog that I've already posted elsewhere? Sure, but we don't consider it to be as valuable as original content posted on Violinist.com only, and thus we may not promote it. Also, please use HTML to add images and video to your blog post, not WordPress tags. If the blog is full of coding from other blog sites, the editor here would need to clean it up so that it is suitable to promote on this site, and that might not be possible. We will no longer be promoting blogs with commercial appeals. Please do not put a tag with your logo, business name or contact information at the bottom of your blog. Readers can find your contact information, biographical information and whatever other information you wish to provide, by clicking your name, which brings them to your profile page. (If you are signed in, you can see your profile page by clicking on "HI ___" in the upper lefthand corner of the page.) On your profile page, by all means, self-promote. But the blog itself must be written for the readers' benefit, completely. Your images also should not have commercial appeals or be an attempt at "branding." If your main objective is promotion, then you may want to consider advertising on Violinist.com. Please see this page for more information about that.